The Middle Grade Review Bonanza is a feature with 2-3 mini-reviews for short MG books we really wanted to read. It’s a new Regular Thing (and we’d love to hear your thoughts and recommendations for future entries). The city of Bryre suffers under the magic of an evil wizard. Because of his curse, girls sicken and disappear without a trace, and Bryre’s inhabitants live in fear. No one is allowed outside after dark. Yet night is the only time that Kymera can enter this dangerous city, for she must not be seen by humans. Her father says they would not understand her wings, the bolts in her neck, or her spiky tail—they would kill her. They would not understand that she was created for a purpose: to rescue the girls of Bryre. Despite her caution, a boy named Ren sees Kym and begins to leave a perfect red rose for her every evening. As they become friends, Kym learns that Ren knows about the missing girls, the wizard, and the evil magic that haunts Bryre. And what he knows will change Kym’s life. 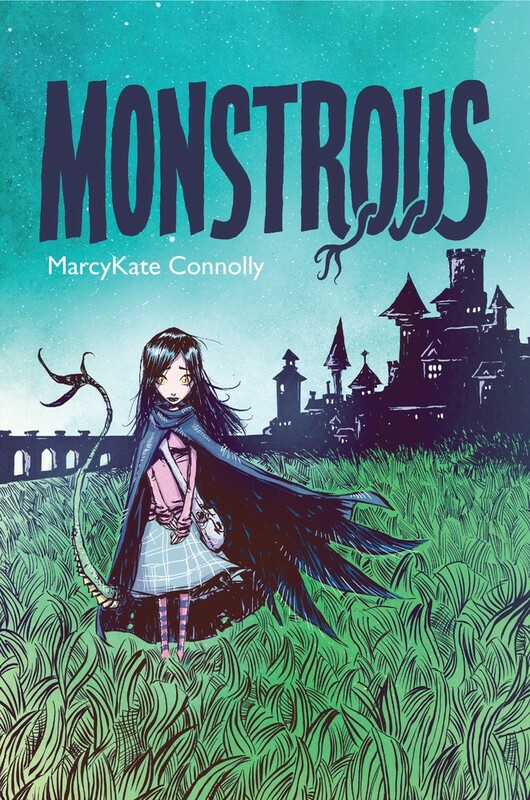 In Monstrous by MarcyKate Connolly (HarperCollins Children’s Books; February 10 2015), Kymera opens her eyes for the first time, takes her first breath and her father tells her: you are alive. The next day she starts training for a dangerous mission: to save girls entrapped by an evil wizard in the city of Bryre. Only Kym can save them: she herself was killed by the wizard and her scientist father brought her back to life as a hybrid creature with wings, bolts in her neck and a spiky tail. Kym has no memories of her life before but she knows she is monstrous and as her father tells her, normal humans will never accept her. But with every subsequent trip into Bryre to save the girls, she starts to realise that her beloved father might not have been completely truthful. Monstrous is a hybrid of familiar fairytale and dark horror with a side of Frankenstein thrown in the mix. It has one of the best opening chapters I’ve read lately and a very surprising and gutsy ending. Book-ended as it is by great stuff, the middle is unfortunately not as strongly developed as I could have hoped given the potential. As a coming of age story including the eventual realisation about Kym’s true identity and nature as “monstrous”, the story suffers from protracted action and a black-and-white stance on evil villainy that counterbalances the positive aspects around themes such as identity and sacrifice. At the end of the day the main problem with the tale though is how predictable and overlong it is, the latter becoming a real problem exactly because of the former. It took far too long for Kym to reach the point where she realised what was really happening when it was very obvious to the reader. Poignant as Kym’s tale was, dark as it is to have a little girl frankensteined, this ended up more on the lacklustre rather than the inspiring side of storytelling. Deep in the forest, in a crumbling ruin of a castle, Sarah begins to untangle the layers of curses affecting her family bloodlines, until she discovers that the curse has carried over to her, too. The day she falls in love for the first time, Sarah will transform into a beast . . . unless she can figure out a way to break the curse forever. 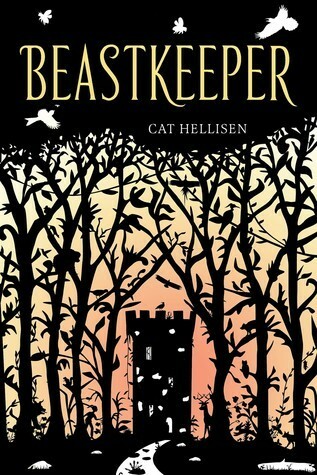 Another fairytale-like story in this batch of short reviews, Beastkeeper by Cat Hellisen (Henry Holt and Co; February 3 2015) is a very interesting retelling of Beauty and the Beast. A young girl discovers her family is cursed after her mother leaves and her father starts to turn into a monster. Left in the care of an uncaring grandmother in a crumbing castle in the middle of a magic forest, Sarah needs to find out the complicated family history before the curse that affects her bloodline reaches her. If Monstrous was overlong and suffered for it, Beastkeeper falls on the other end of the spectrum: at 208 pages, it is too short, too brief to be able to fully engage with all of its disparate storylines and the ups and downs of an extremely intricate curse. However, the writing is beautiful, with a flowery prose that falls just shy of purple and the main character Sarah is such a fantastically precocious, loyal and well-developed character that I was able to overlook its problems and engage fully with its strengths. Out of the latter, it’s the underlying themes surrounding the story that truly shine. Beastkeeper tells a thoughtful tale that examines the nature of “everlasting” love as an unchallenged notion and its side notes of jealously, pride and lack of empathy. Like Monstrous, Beastkeeper surprised me with its dark overtones and how it did not spare its main characters from encountering difficult and painful obstacles in the course of growing up. Schoolgirl detectives Daisy Wells and Hazel Wong are at Daisy’s home, Fallingford, for the holidays. Daisy’s glamorous mother is throwing a tea party for Daisy’s birthday, and the whole family is invited, from eccentric Aunt Saskia to dashing Uncle Felix. But it soon becomes clear that this party isn’t really about Daisy at all. Naturally, Daisy is furious. Then one of their party falls seriously, mysteriously ill – and everything points to poison. With wild storms preventing anyone from leaving, or the police from arriving, Fallingford suddenly feels like a very dangerous place to be. Not a single person present is what they seem – and everyone has a secret or two. And when someone very close to Daisy looks suspicious, the Detective Society must do everything they can to reveal the truth . . . no matter the consequences. Oh, but this was delectable. The new adventure of best friends and amateur schoolgirl detectives Daisy Wells and Hazel Wong is even better than their first outing in A Murder Most Unladylike. The girls are spending their holidays at Daisy’s home, Fallingford when during Daisy’s birthday tea party, an unwelcomed guest falls fatally ill. Suspecting foul play, the girls of the Detective Society set out to investigate and do everything to reach the truth – even if some of the suspects turn out to be members of Daisy’s own family. 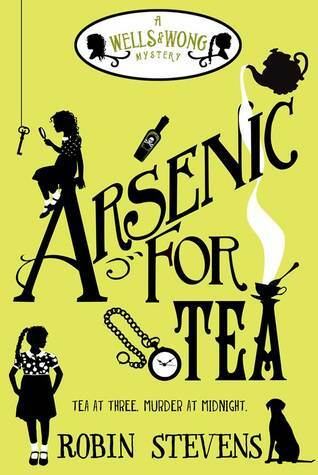 Arsenic For Tea is a dinner murder mystery in a secluded English country house and like much of these types of mystery novels, the fun resides in following the astute observations made by their narrator – in this case, Hazel Wong, who as a Chinese expat, has an incredible outlook on the English lifestyle and norms of behaviour. Just like its predecessor, Arsenic For Tea is really good at not pulling punches and at exploring the beautiful yet fraught relationship between Daisy and Hazel. Bonus points for: Uncle Felix, bunbreaks, BFFs and terrible mothers who happen to also be people. Plus, and I don’t want to spoil it too much, but this time around Daisy and Hazel are not the only lady detectives either, officially or unofficially. I will leave it at that and urge you to read these delightful novels. The third book in the series, Third Class Murder comes out in July and I am so ready to continue being delighted by this series. I agree that Monstrous was disappointing for exactly the reasons you mentioned. It’s far too long and has way too much set up. I wondered if kid readers would pick up on what was really going on as fast as I did, but even taking into account they wouldn’t, it took too long to get to the point. Then it ends so abruptly. I liked Beatkeeper a lot. I thought it was a perfect length for what it was doing. I also liked the way the romantic element was handled. I have an ARC of the first Wells and Wong book and can’t wait to read it.